Two pods of pilot whales, totaling 145 individuals, were found stranded on New Zealand’s shores on the evening of Saturday, November 24. Unfortunately, all of the animals have now died. 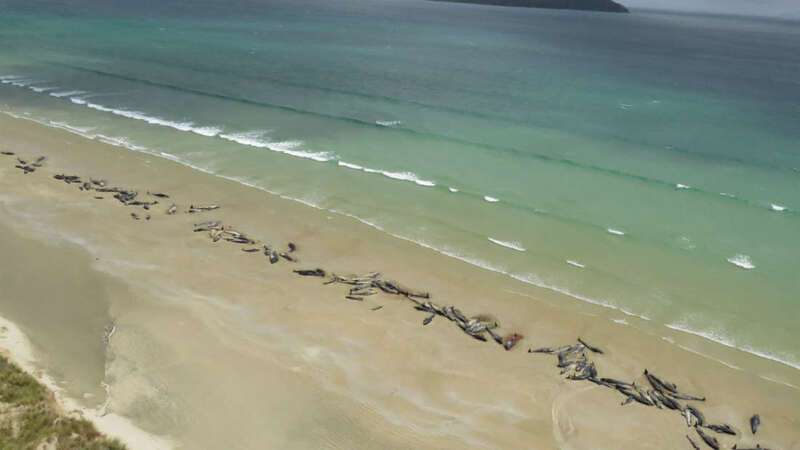 The whales beached on Stewart Island, a small island off the south coast of New Zealand’s South Island. The two pods were discovered roughly 2 kilometers (1.2 miles) apart. About half of the whales were already dead when they were found, while the remote nature of their location meant that trying to rescue the remaining survivors would have been too difficult. Therefore, officials made the difficult decision to euthanize the animals to minimize their suffering. “Sadly, the likelihood of being able to successfully re-float the remaining whales was extremely low,” said Ren Leppens of New Zealand’s Department of Conservation in a statement. “The remote location, lack of nearby personnel and the whales’ deteriorating condition meant the most humane thing to do was to euthanize. So why did the whales end up on the beach? Stranded whales aren’t all that uncommon in New Zealand, with the Department of Conservation responding to roughly 85 incidents each year. In February 2017, 416 pilot whales became stranded on the coast of the country's South Island. However, strandings normally just involve a single animal. It’s unclear exactly why the whales became stranded, but there are many different factors that could have played a role. They may have been chased into shallow waters by predators, such as orcas or a large shark, they may have been sick, or they could have been affected by extreme weather. The whales may even have gotten lost or been caught out by a quickly retreating tide. Although human intervention does sometimes successfully save beached whales, the animals often die due to dehydration, collapsing under their own weight, or even drowning if the tide rises over their blowholes. The pilot whales weren’t the only cetaceans to find themselves stuck on New Zealand’s beaches this weekend – on Sunday 10 pygmy killer whales became stranded on the North Island's Ninety Mile Beach and a sperm whale beached on Karikari Peninsula, also on the North Island. According to the Department of Conservation, the various strandings are unlikely to be related.